San Luis Obispo County Sheriff’s Deputies are searching for a suspect who stole nearly $1,000 in cash from Lopez Continuation High School last month. Some of the money that was stolen had been raised by students for their prom, according to the sheriff’s office. 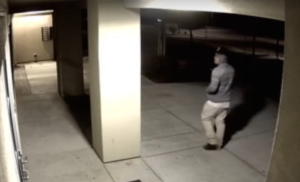 On Wednesday, the sheriff’s office released surveillance footage of a man prowling around the entrance to the high school on the night of April 11, when the burglary and theft occurred. The man was wearing a gray sweatshirt with a black hat and his face appeared to be at least partially covered. Sheriff’s officials request that anyone who can identify the suspect call deputy McDaniel at 805-788-3425 or email him at jmcdaniel@co.slo.ca.us and reference the case number 1704-03055. First of all…. whoever stole the money… is not a suspect. they did it. The person on the video is a suspect and may have done it. Or not. Check the school records. This guy was pretty comfortable working around there, seemed to know way and by the looks of his attire check (out the hat) this was not the first time. Check with Morro Bay High, they also had several incidents in the past month!